Steph: How did you get started in this business? How long have you been producing &/or dyeing yarn? Kim: It started 15 years ago with a single German Angora rabbit which quickly grew to 15 rabbits. I started off with dyeing angora and blending it with merino/silk fibers and slowly added yarns to the mix. I prefer dyeing yarn, so that has been my focus for the last number of years. How do you choose your yarn bases? Are your having any made specifically for you? What are your favourite fibers to work with? Yarn bases are very important to me. They have to be something that I would enjoy knitting and I usually prefer the more luxurious yarns. My current favorite is my yarn base Opal, which is a blend of Cashmere, Silk and Merino. I loved working with Opal. What inspires your colorways? Usually Nature. I can take a walk on a warm Autumn day and come home with many color patterns swirling around in my head. What festivals or conferences do you go to as a vendor? I don’t do too many festivals as my online store is fairly busy, which makes it hard to get away. I currently vend at NETA SPA weekend, Fryeburg Fair, The Squam Arts Fair ,The Fiber Revival in Mass and more recently at SOAR. I do plan to investigate vending at New Hampshire Sheep and Wool Festival this year. How do you utilize the internet and social media as an indie dyer? Given that the bulk of my business is done via the internet, I do try to stay in touch with people via my blog, facebook and of course, Ravelry. I am fortunate to have a strong repeat business base of women that I really enjoy. I start out with tending to the dogs, responding to emails and breakfast, then I go out to the studio. A typical day would be dyeing in the first part of the day, then reskeining and getting yarns boxed and ready for shipping before the post office closes. If I have time in between, I try to squeeze in some sewing. Evenings usually have me printing out labels, answering emails again, blogging and finally time to sit and relax with some knitting and a glass of wine. My husband just finished a new studio space for me in our barn. It has a small retail space in the front, a large work table, 2 stove tops and a sink. It’s a beautiful, bright and cheerful place to work. Upstairs is where my electric winders, spinning equipment, looms and sewing studio live. It is also where I keep all of my shipping supplies. I feel amazingly fortunate to have such a wonderful space in which to work. What’s your favorite thing about dyeing yarn? Least favorite? I’m including all things ancillary to actual dyeing as well – so feel free to address marketing, website design, etc, etc. Favorite….playing with colors and seeing them evolve into colorways that make people smile. Least favorite is reskeining yarn…..it’s always a fight it seems to get the yarn to behave on the winders, but the end result is worth the struggle. Currently my website is giving me headaches as well…I am looking forward to having it redone once I can afford to do that. Any dyeing or yarn plans for the next year you care to discuss? My yarn club for 2012 had a Roaring Twenties theme. 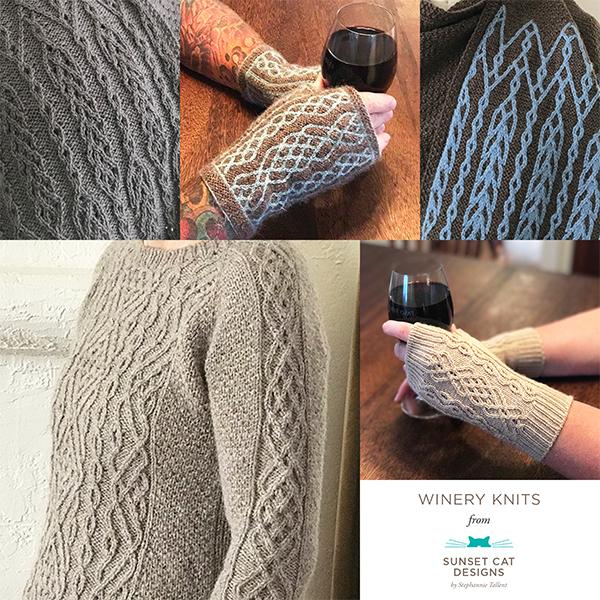 I had 6 of my favorite designers create one pattern for each shipment. Want to have a chance to win your very own skein of Opal in the Godiva colorway? Leave a comment on what base(s) &amp; color(s) are your favorites from Kim’s site, The Woolen Rabbit, on this post, by midnight PST July 30th. I’ll use the random number generator to pick a winner. US addresses only, please, sorry!